Version: Belongs to the first layer of the header and is of 4 bits. This defines the version of IP i.e 4 for IPv4. Internet Header Length: This is also 4 bits and it defines the total length of the header in multiples of 32. This includes the length of any options fields and padding. The normal value of this field when no options are used is 5 (5 32-bit words = 5*4 = 20 bytes), or simply 20 octets. DS: This field determines what service is used and measures its quality etc. also known as Differentiated Services. This is 6 bits in length. ECN: The Explicit Congestion Notification field is 2 bits in length and are used to detect congestions in the network and tells the end node packets that there are congestions ahead. Total Length: This tells the total length of the IP datagram including header + data. Since this is 16 bits in length so the maximum length of the IP datagram comes out to be 65,536. Flags: Flags control data fragmentations. It is 3 bits in length and contains 3 flags out of which two controls fragmentation and one is reserved. Fragment Offset: When fragmentation of a message occurs, this field specifies the offset, or position, in the overall message where the data in this fragment goes. It is 13 bits in length. Time to Live (8 bits): Specifies how long the datagram is allowed to “live” on the network, in terms of router hops. Each router decrements the value of the TTL field (reduces it by one) prior to transmitting it. If the TTL field drops to zero, the datagram is assumed to have taken too long a route and is discarded. Protocol: Identifies what protocol is used e.g. TCP (6) or UDP (17). It is 8 bits in length. Header Checksum: It is 16 bits long and use as an error checking code. Source Address: IPv4 is 32 bit address and this layer of the header tells the source address of the originating IP datagram. 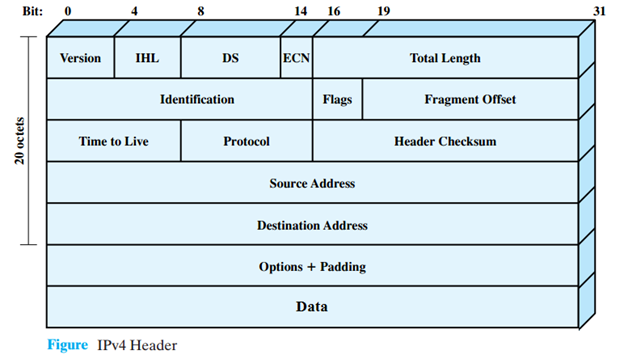 Destination Address: IPv4 is 32 bit address and this layer of the header tells the destination address of the IP datagram. Padding: Use to complete the 32 bit profile for Options or its multiples by adding 0’s. Data: The data to be transmitted in the datagram.